A huge travelling contingent of 1,258 Castleford Tigers fans made the journey to France to support their team on Saturday and have been thanked for their incredible backing by the club’s director of rugby, Jon Wells. 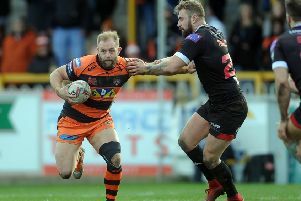 Wells admitted the performance on the pitch was not up to the standard required as the Tigers were heavily beaten 44-16, but he was full of praise for the continued support of the fans. He said: “Firstly, I would like to acknowledge what was a poor performance by the team on Saturday in Catalans. We have endured an horrific injury toll over the last month and have repeatedly found ways to win without many senior players, but on Saturday it’s fair to say that unravelled a little. “Notwithstanding that fact, I thought Catalans were extremely professional and showed a ruthless streak that should worry anyone who faces them for the remainder of the season. “The main message this morning, however, is that of gratitude from the players, coaching staff and the club as a whole for the simply fantastic travelling support we received in the South of France. Wells added: “I spoke to many of you on the plane over and back, and at the airport about the game in particular and the season and our ambitions this year in general and although I know the result wasn’t good enough that shouldn’t and doesn’t mean any less to us. “So, on behalf of everyone at the club – thank you – and let’s meet up again on Sunday as we look to put right what we got wrong last weekend. We are developing a culture of success at the Castleford Tigers and the support we receive is an integral part of that. Castleford will take on a Leeds Rhinos side on Sunday without Brian McDermott at the helm after he was sacked this morning. Kick-off is 3.30pm.